Peter F. and Helena (Schultz) Wiebe. Preservings Photo. Peter F. Wiebe: minister, Chortizer Mennonite Church; born on 11 July 1890 in Chortitz, Manitoba, to Jacob D. and Helena (Funk) Wiebe, as the second of 11 children. Peter F. Wiebe grew up in a family of leaders in southern Manitoba. His grandfather was Bishop Gerhard Wiebe (1827-1900), leader of the Bergthaler Mennonite people from 1866-1882, which included the migration from Russia to Canada. Most of Peter’s brothers became teachers. When Peter finished his basic education, he decided to follow in their footsteps. After a year of training in Gretna, he started teaching in Reinland. 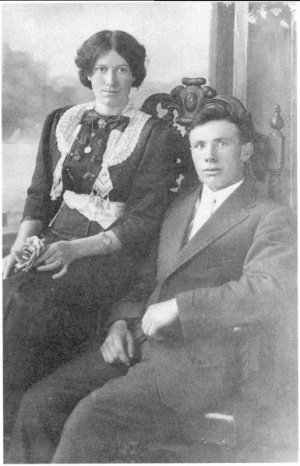 There, he met and married Helena Schultz (1894-1987), daughter of Aron H. and Margaret (Sawatzky) Schultz. The young couple lived with Helena’s parents while they built a store in Chortitz. Half a year later, the store was ready, and Peter and Helena began to sell hardware and groceries. Although storekeeping was a success, Peter F. Wiebe decided to move to Steinbach in the early 1920s. In the years after the First World War, many Mennonites in Manitoba decided to leave Canada and move to Mexico or Paraguay. Peter also considered departing for a new country, but he wanted to be sure that the move would be beneficial before he made the final decision. To prepare for a potential move, he sold the store and rented an abandoned schoolhouse in Steinbach. The family lived there while Peter began working as the manager of a grocery store across the street. Soon, he found what seemed like an ideal investment opportunity in a newly opened bank, and he deposited his savings from the sale of his store there. However, when the bank manager embezzled funds to pay gambling debts, Peter and many other people in the community lost their money. After this, Peter and Helena moved to a farm near Niverville, Manitoba. Although Peter F. Wiebe was no longer teaching in a school, his skills were useful again when he was called to the ministry on 21 December 1926. He was ordained the next year in Chortitz and then began a preaching rotation in the Chortitzer churches of the East Reserve. He preached at churches in Weidenfeld, Reinland, Steinbach, and other communities in the area. During the 1940s he also spoke in special locations such as the Conscientious Objector camps. In 1948, about 120 Mennonite families emigrated from Manitoba to Paraguay. The group chose Peter to speak at their farewell service. Peter also held services in his home after he and Helena moved to MacGregor in 1950. After official retirement and a move back to Niverville in 1960, Peter F. Wiebe continued preaching. He delivered his last sermon on the Sunday before his death. He died in Niverville on 29 March 1966. Giesbrecht, Esther Hiebert. “Rev. Peter F. Wiebe (1890-1966), Niverville.” Preservings No. 14 (June 1999): 96-98. GRANDMA (The Genealogical Registry and Database of Mennonite Ancestry) Database, 5.03 ed. Fresno, CA: California Mennonite Historical Society, 2007: #348824. Huebert, Susan. "Wiebe, Peter F. (1890-1966)." Global Anabaptist Mennonite Encyclopedia Online. November 2007. Web. 22 Apr 2019. http://gameo.org/index.php?title=Wiebe,_Peter_F._(1890-1966)&oldid=96835. Huebert, Susan. (November 2007). Wiebe, Peter F. (1890-1966). Global Anabaptist Mennonite Encyclopedia Online. Retrieved 22 April 2019, from http://gameo.org/index.php?title=Wiebe,_Peter_F._(1890-1966)&oldid=96835. This page was last modified on 23 August 2013, at 14:53.